Preaching was never something I expected to do, week in and week out. I saw myself as an associate. I'm certainly not gifted, that's for sure, but the insights I believe come from the Spirit gave me confidence to speak. But without the Spirit, I feel like I'm pulling stuff out of the air.. Not sure how, if at all, the lack of feedback from the congregation is impacting this feeling. You are not alone. Jesus told his friends, "I will ask the Father, and he will give you another Advocate, to be with you forever. This is the Spirit of truth, whom the world cannot receive, because it neither sees him nor knows him. You know him, because he abides with you, and he will be in you. I will not leave you orphaned..." This is a promise that can be trusted. As far as I can tell, Jesus has always been true to his word. You are not alone. Many, if not all, preachers have times when pulling the pieces together is difficult. Times when it is really hard work. For me, when I get stuck, I usually end up following the advice of an old preaching professor. Sum it all up in one sentence. What is the point of the text, in one sentence? The writing may continue to be work that day, but at least I know where I'm headed. And then there's a prayer that I sometimes use, "God this is either complete crap or something really great. Could you please work it out? I've done all that I can." You are not alone. Pastors rely on the RevGals "Saturday Preacher's Party," because sometimes they get stuck. Sometimes they need a nudge, or an idea, or a good illustration. Jenee Woodard spends great gobs of time collecting and collating resources at TextWeek.com, because preachers need help. Folks got really uptight this weekend when WorkingPreacher.org went offline because of power outages in St. Paul. There's a reason there are so many books, articles and blogs on next Sunday's lessons. And I really suspect that the Holy Spirit is lurking around in those resources. I don't think the Holy Spirit has left you. I don't believe she works that way. I think you might be having a dry spell. Maybe you need to cultivate some new resources. Perhaps you need to develop a new discipline for sermon writing. Or maybe you would find talking to a Spiritual Director or a well seasoned pastor to be helpful as your work out this aspect of your call. Whatever you decide to do, the God who chases us to hell and back, is not about to leave you stranded in the pulpit. You are not alone. No, Virginia, the Holy Spirit does not leave us. God never leaves us. What you are experiencing is very typical of the newly ordained: Somewhere during the second year of ordination or in a new parish the bottom falls out of our vocation, it seems. I experienced it. I have seen it in so many new pastors and it comes no matter how old we are or how young. But it is a matter of the 'training wheels' that God ordained us with have come off. And wait until the third year when the 'boo birds' come out and every criticism of your ministry gets flung at you and you want to find a hole to crawl into. It is part of the cycle of ministry and we all go through much of the same stuff. You are not the only person that this has happened to. Get some rest--are you taking your days off and are you sleeping enough? Did you rest on your vacation? What is your personal prayer life like?--have you ignored it or been too busy to take the time of spending time with God? What are you reading? Is it something that can feed you spiritually, theologically, or does it delight your soul? Take some work time to make a spiritual retreat. Work that out with your board. It should be part of continuing education but instead of studying, spend the time relaxing in God's presence. I generally have 3 books working at all times: 1 for pleasure, one for spiritual growth and one that just makes me think. Some of these can be on audio so that you can listen while you drive or walking or doing whatever exercise you choose. Get some physical exercise. It really does make a difference to how the Spirit flows through you. There are 3 things that you need to plan into your day without fail: Prayer, reading and rest. If they are not part of your everyday, you WILL fail because you are not doing your job. You are the spiritual leader of your flock. You must spend time with God every day. It should be planned into your work time. Often your parish will not understand that--but you need to make it clear that if you are going to pastor them, your prayer time is part of your work time. You need emphasize this for your board. Spiritual ennui, or flatness is the name of the demon in ordained ministry. You will wrestle with it your entire career. Sometimes it will be a result of your own inattention to prayer or your spiritual life. At other times it just is--But remember that Elijah finally heard God in the silence--that silent voice that one must be silent to hear. I also find that when I am at my most detached from God, God is asking me to have faith in a bigger way, a more determined way. When I am at the driest I find that if I will spend the time doing the 'due diligence' of study and preparation, it helps. There will be times when your sermons will be limp but someone out there will need just that sermon that you think is crap. Fear not, God is still with you because God made you and has promised to be with you forever. Trust in that and relax. You don't have to be a dazzling preacher in order to be faithful. And all God asks of us is to be faithful. Your parish may ask for more--but God only calls us to be faithful. And there you have it -- I marvel every week at how the Matriarchs exemplify just what is best and most invigorating about the whole RevGal conversation, with its integration of the pragmatic and the mystical, the inspiring and the matter-of-fact. Time now to add your voices to the discussion -- what has your experience been? and how have you responded? We are in need, too, of your questions, your own quandaries and conundrums about the ministry life -- always welcome at askthematriarch@gmail.com. I have been preaching about eight years; those who wrote above are spot on! The words and tides of ideas ebb and flow and when we're seemingly stuck on a sandbar, we get to do what Paul calls us to in this week's lectionary...to not only live by the Spirit, but to be guided by the Spirit. Currently, I am in the dry time. So my method is this: I find one phrase or sentence in each lesson that speaks to me, that seems to touch or reach out to me. From those, I find things that connect them...theology, stories, anecdotes from the week...and always, there emerges a gospel focus...love, forgiveness, abundance. For this week, my title came from the psalm, "the fullness of joy." I write only a small 7-8 line outline that guides me through these thoughts. I make sure to write the gospel thought so it does not unintentionally get left out and I simply talk through the points. I think that the gospel message I discern is the same thing the writer above wrote about when she suggested you 'find the central theme in one sentence.' It's the heart of the Word you'll share. I hate preaching this way. I get the most feedback from this style of preaching, good and challenged. It prompts the most conversation during fellowship time and I am typically more pointed in what I say than when I script everything out. Did I mention that I do not like preaching this way? It is a faith walk for me and it holds me accountable in my thoughts as I prepare and it holds me in check as I speak out the message that comes through the points. I love it when this breaks and I can go back to scripted sermons, when the tides bring me back in to the stream of ideas that are cohesive and simply discernable. But it is normal to not be in control when we are guided by the Spirit. I'd rather live by the Spirit, to be sure I've checked all the boxes, crossed all the T's and dotted all the i's. Good luck and know that you are not alone. Thank you for this, lorrainefort -- a very helpful response to a shared predicament! Dear Sister, I am praying for you. The sermonating process usually involves me in tears at least once during the preceding week, this is a hard calling, but as mentioned above, we are called to be faithful above all else. I would add that it is important to spend time on a regular basis (I do it weekly) with colleagues discussing the texts but also receiving and offering support for this crazy vocation. 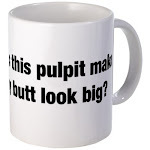 If your synod/presbytery/district/church organization of your choice does not have text studies already organized, perhaps there is a group of other clergy that might be interested in gathering together over coffee each week. It's my favorite part of each week. Blessings and peace. Thank you, Amy -- I second this suggestion -- and I'd underline, about now, the blessing that ECUMENICAL study and support groups can be. I don't know what our enquirer's denominational tradition is, but no one tradition in my experience has full command of ALL THE RESOURCES for preaching, or composing a sermon, or facing spiritual dryness, or what have you. (Oh all right, yes, Anglicans/Episcopalians come pretty close. BUT still... ;-) ) Your neighbour just down the road in That Other Church may have exactly the words you need to hear... blessings and courage!